One of the hottest new hair care inventions, Liquid Keratin is the first at-home keratin solution that transforms frizzy, uncontrollable manes into smoother and more manageable strands. Free from formaldehyde and harmful chemicals, one Liquid Keratin Straight Smooth Long and Strong treatment can last up to 6 weeks. Containing keratin, silicone, and amino acids, the Liquid Keratin hair care collection also features shampoo, conditioners, and serum to help extend the life of the treatment. 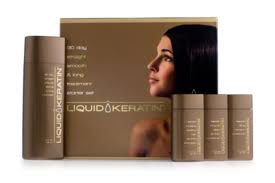 Liquid Keratin Hair Treatment is a spray-on protein treatment designed to improve the health and strength of hair. The makers of Liquid Keratin Hair Treatment claim their product can reduce hair damage within 30 days of use without the use of chemicals or formaldehyde-containing ingredients. The Liquid Keratin Hair line includes the original 30 Day Straight Smooth and Long Treatment, a spray-on treatment containing keratin. Additional products include the Liquid Keratin Infusing Healthy Hair De-Frizz Shampoo, the Liquid Keratin Infusing Deep De-Frizz Conditioner, the Liquid Keratin Filling Leave-In Conditioner, the Liquid Keratin Sealing Shine Serum and the 30 Day Straight Smooth and Long Treatment.